Ground squirrels have been identified as the most common vertebrate pest in agricultural areas, but they can also be pests in urban and suburban areas. There are several species of ground squirrel in California, but the California ground squirrel is the species most likely to be a pest of landscapes, gardens, and structures. Some tree squirrel species can also be problem pests around homes and gardens where they feed on a variety of nuts and fruits, or cause damage by gnawing on cables and gaining entry into structures. While ground squirrels and some species of tree squirrels can be pests, flying squirrels are very elusive and not generally considered pests. It is easy to distinguish the different squirrel groups from each other: when you startle a tree squirrel it will generally run up a tree, while a ground squirrel will typically retreat to an underground burrow. Ground squirrels are capable of climbing, but they are often not seen very high in trees, and tree squirrels almost never retreat into burrows on the ground. It can be difficult to visually tell the difference between the species within the groups, especially between tree squirrels. Squirrel management requires different tactics, so it's important to identify the squirrel species correctly and be aware of any legal restrictions before beginning any management plan. There are four species of tree squirrels in California (Table 1); two species are native and two are introduced from the eastern part of the United States. Regulations regarding management of tree squirrels are complicated, so it is extremely important to be able to identify squirrels to species level. Douglas squirrels (Tamiasciurus douglasii), sometimes called chickarees, are native to California and found in coniferous forest regions of the north coastal area and along the Sierra Nevada Mountain region. These very vocal tree squirrels are not usually considered pests. However, they may become garden or home pests in more remote rural areas. 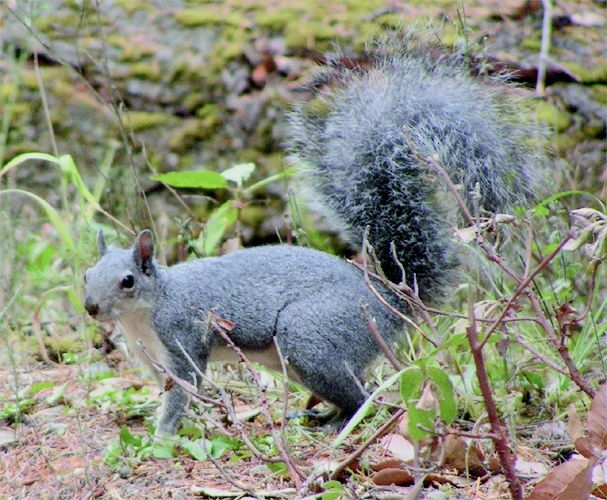 Western gray squirrels (Sciurus griseus) are native and found throughout much of California, primarily in oak woodlands of the foothills and valleys and in pine-oak forests. Western gray squirrels are gray above with distinct white underparts and prominent ears. They are distinguished from the eastern gray and other squirrel species by their very long bushy tails that are primarily gray with white-frosted outer edges. Eastern gray squirrels (Sciurus carolinensis) were originally introduced from the eastern United States into Golden Gate Park in San Francisco, California. They are also established in areas of Calaveras and San Joaquin counties in California and may be expanding their range. They can be variable in color. As their name suggests, they have a mostly gray coat. Eastern gray squirrels can also have a reddish tint to their coats. Eastern gray squirrels are medium-sized, with relatively narrow tails and short ears as compared to western gray squirrels. Eastern fox squirrels (Sciurus niger) were also introduced from the eastern part of the United States and are well established in most major cities of California. Fox squirrels can be identified by their grizzled yellow-brown to orange coat, tan to reddish-brown underside, and bright orange-brown ears. The fox squirrel, often incorrectly referred to as the red squirrel by residents of California, is visually distinguishable from the native western gray squirrel; the western gray squirrel is slightly larger, has silver-gray fur with creamy white underparts, and has a notably bushier tail. California ground squirrels (Otospermophilus beecheyi), sometimes referred to as just ‘ground squirrels', are native and found in almost all regions of California. They have mottled fur that is light and dark brown, gray and white on their back. Their underside is lighter with a combination of lighter browns, grays and white. They have a semi-bushy tail, which can add to confusion when distinguishing them from tree squirrels. California ground squirrels also have a white ring around each eye. 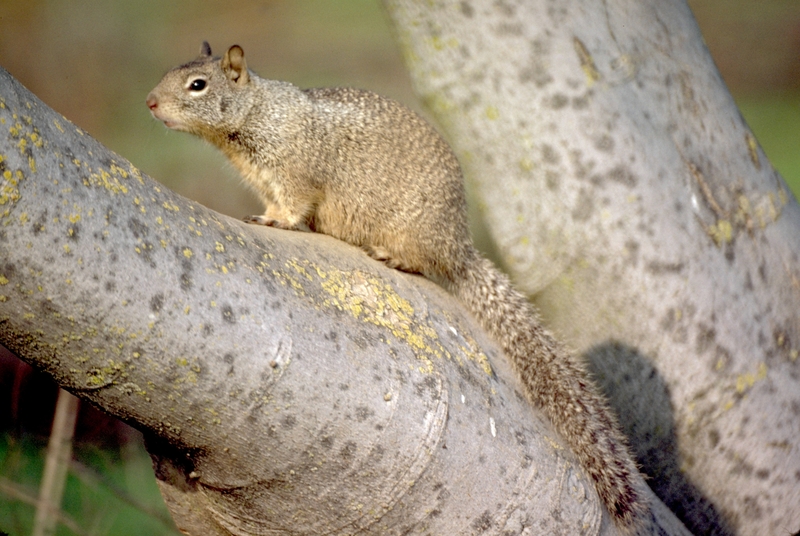 Under the California Fish and Game Code, tree squirrels are classified as game animals and their management is much more complicated than for ground squirrels. First and foremost, it is illegal to use poison baits in the management of ANY species of tree squirrel in California, but their use is permitted for California ground squirrel management. If both ground squirrels and tree squirrels are causing damage at the same location and are in need of management, baiting would not be a recommended option, as it would be almost impossible to exclude tree squirrels from accessing poison baits. It is also important to be aware of endangered species in your area. If you are in the range of the San Joaquin antelope squirrel (Ammospermophilus nelsoni) or the Mohave ground squirrel (Xerospermophilus mohavensis), you should not consider a baiting strategy for California ground squirrel. Instead, consider other, non-toxic options described in the UC IPM Pest Notes: Ground Squirrel.